JSW Powersports started out in humble beginnings back in 1998 with a small workshop servicing personal watercrafts. Over the last 15 years we have grown into becoming the largest watercraft dealer in Australia and have been awarded the coveted title The Number One Sea-Doo dealer in the world. This is no small feat for a Gold Coast based business considering the worldwide scale of the personal watercraft industry today. We started selling all brands of PWC under the name Jet Ski Warehouse in 2001. The business grew in leaps and bounds and we soon outgrew our premises forcing us to move in 2011 to Ereton Drive in Arundel. 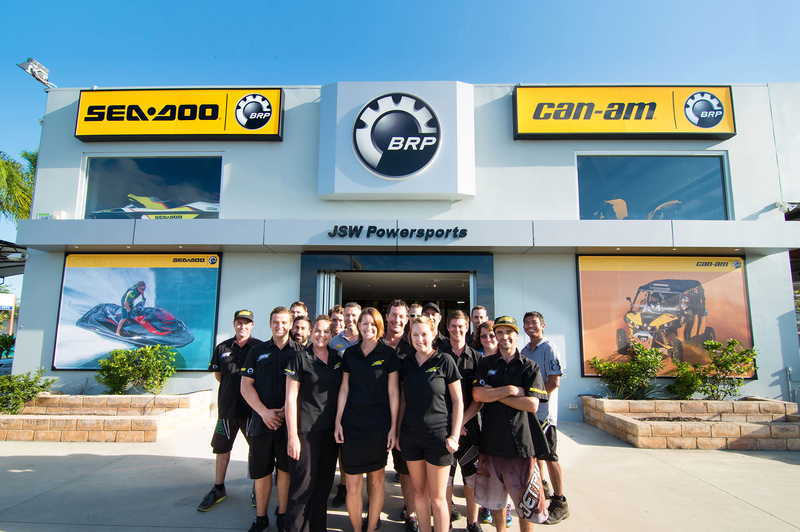 Along with this move we became JSW Powersports the Sea-Doo dealer on the Gold Coast and are now Australia’s flagship Sea-Doo store. Our trademark ‘Great wall of Sea-Doo’ made from crates of new PWC contains stock of the full Sea-Doo range giving our customers a wider range of choice when purchasing their Sea-Doo. We believe you should be able to walk away with your purchase..... at JSW Powersports you can! We are the Australian distributor of Sea Fox Boats, the 6th largest boat manufacturer in the US, and carry a number of boats from the Sea Fox Range. After owning a Sea Fox himself our company owner Jeff McNiven felt that this evolving brand had to be available to the Australian market. Nearly 20 years ago, Sea Fox Boat Company began with a clear governing philosophy at heart: to develop and build quality hand-crafted saltwater boats that are durable, dependable and affordable. The outcome is a fantastic product that is rapidly taking over the Australian market. The growth and success of JSW Powersports is directly related to the passion our team shows towards the industry as well as understanding our customer’s needs.